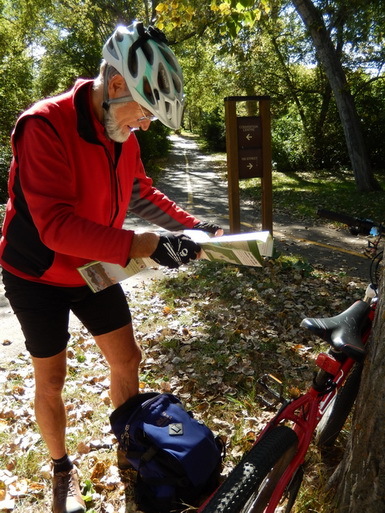 Map reading in Edmonton’s river valley bike network system. During 2013 visit where we rented bikes. Sometimes he’s here, on Cycle Write blog. But so far, if he appears, – he’s silent and gentle. That’s Jack — my partner in life , in cycling and at times, even in blogging. I have launched and written some blog posts for 2 of his blogs for his cycling consulting and advocacy work. Hey, it’s fair swap for his time spent on changing my flat tires and minor bike repairs. I can’t forget also for all his legwork on bike trip planning and patiently leading a geospatially challenged nerd like me. Waiting for bike shuttle to take us through George Massey car tunnel (illegal for cyclists). 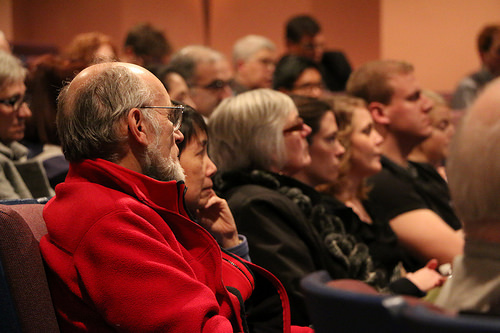 Richmond, BC 2014. Little did I know over 23 years ago when we met, my world would take a major spinning change. I never dreamt of exploring the world beyond my home city, by bicycle. I had no inkling I would become a long-time cycling enthusiast. I was just a willing cycling newbie. Several months ago before I met him, I was hankering to buy a bike and get back into cycling after a 12 year hiatus. Jack and I share many things in common. Cycling as a shared passion, does foster some idiosyncracies that other non-cycling folks may find puzzling, even incomprehensible. 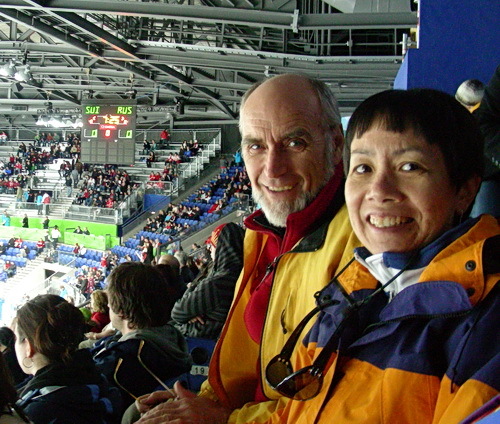 At Winter Olympics 2010. Just before women’s ice hockey game Russia vs. Switzerland. Vancouver BC. We love cycling together. Yes, for the longest time, he was often the lead. But never too far away. On multi-day trips or longer, he would scope out the bike routes. I would pick accommodations and local attractions. Accompanying Jack for a few km. when he started his solo 400+ km. bike trip from Toronto to Montreal. Summer 2008. To me, he’s the black beetle on these long trips, because that’s what he looks like –1 km. ahead of me. Fine by me. As long as I can see him. If he reaches a critical road junction or curve, he waits patiently for me. So my sweetheart says she just can’t handle the ‘Danger and Worry’ of me commuting on a bicycle – and asks that I wait 90 days. – and I am willing to do so for Marital Harmony – but what can I do to assuage her worries – I intend to commute at 5 AM and return home at 2:30 PM each of which are not peak traffic times around here….. I have explained the route, quoted statistics shown her that I am lit up like a Christmas tree – and no go…… Sounds Like I will not be commuting this winter….. oh well but I wanted to prove I could do it – what thoughts/arguments do you think I could use? 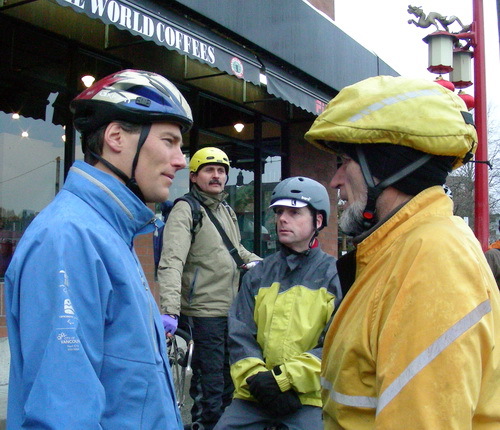 Speaking with cycling Vancouver Mayor Gregor Robertson. 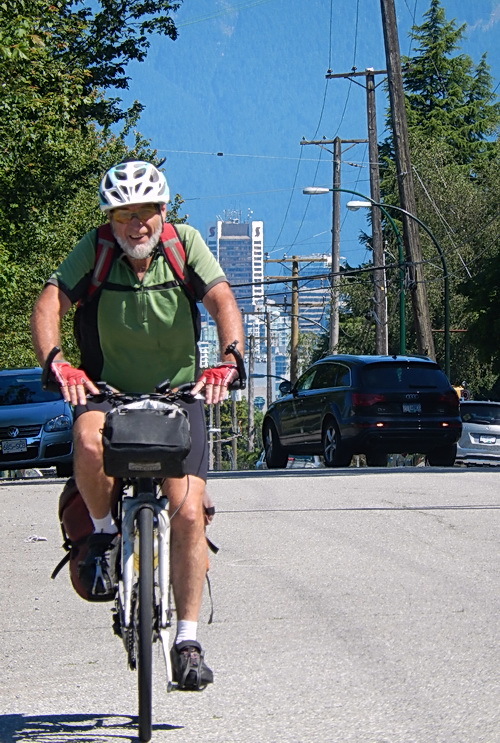 Just before celebratory bike ride for opening city’s 2nd separated bike lane on Dunsmuir Viaduct in downtown core. Apr. 2010. 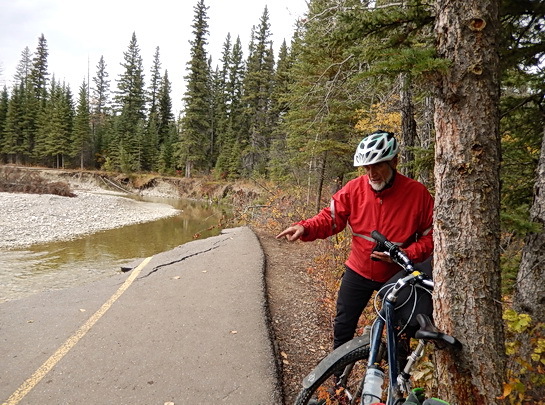 Pointing out to a broken washout section of bike path in Fish Creek Park several months after 2013 major river flood. Calgary AB. Photo by J.Chong Oct. 2013. 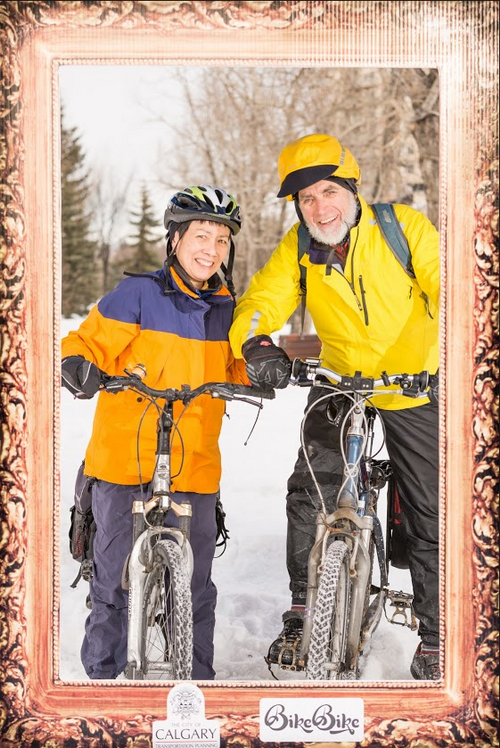 Partaking in Winterpalooza 2014, a winter cycling celebration week. While I may worry abit when Jack’s cycling solo for weeks, we enjoy chatting up every evening to share the day’s events. It does help him that I am a cyclist and know some of the physical and mental challenges for any cyclist, particularily in long distances across rural Canada and U.S. or just navigating crappy road traffic at times. Skyping me from a mountain area campground washroom in Revelstoke, British Columbia. I could see people using the washing machine on the premises too. After a long, shocking day at work in Toronto, on the day when 911 planes hit the World Trade towers in New York City, I went home. That evening, Jack phoned me after a 100 km. bike ride, from the town of Marathon in northern Ontario. He had gone into a pub in White River. All the local patrons were glued to the tv. They were watching news replays of the horrifying plane attacks. Jack also learned all planes, even seaplanes, little charters were forbidden to fly that day. Like all planes worldwide. As for what we’ve experienced as a cycling couple on our trips: that deserves a separate blog post. Stay tuned! Ocean and Kauai Island mountain cliffs in background. Hawai’i 2002. After Jack’s 6 month solo cycling trip in New Zealand. Sitting under splendid art nouveau stained glass art and gold gilding just before a baroque music concert. Municipal Hall. Prague, Czech Republic 2010. Mafia jokester before my nephew’s wedding. Casa Loma, Toronto ON 2013. We enjoy wandering into bike shops together or on our own. We drop by bike shops when visiting another cities during a trip. He and I each have 4 bikes. So yea, that’s 8 bikes in total. Throw in a bike trailer for him too. To match all that, we have several U-locks and piles of bungy cords. Bungy cord tieing down a pile of 3 flats of fresh blueberries onto bike rack. Calgary AB 2013. A cycling partner understands the need without complaining: a pile of bike lights (in various ages), 6 helmets, several cycling jackets, multiple pairs of bike gloves, bike shoes and tights for both spring and winter. Birthday and Christmas gift-giving often guarantees at least, 1 bike-related gift for one another. Since we don’t have a car, we cycle commute for shopping and errands. 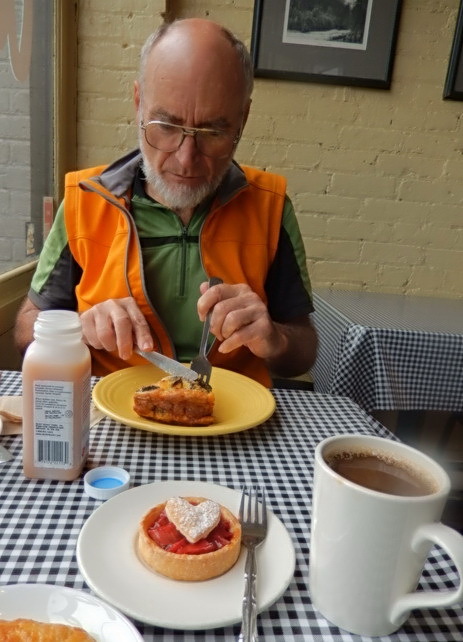 For awhile, I tolerated his penchant to pile several flats of fresh blueberries on top of his rear bike rack, in addition to laden panniers. 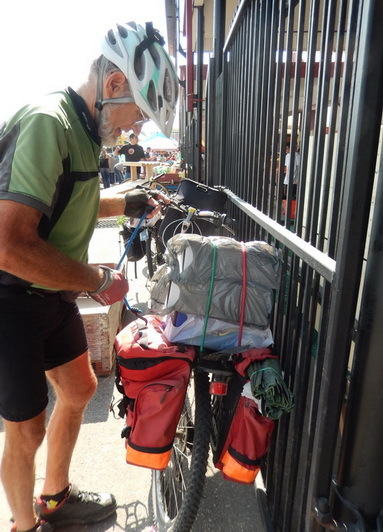 Then I started to tie down toilet tissue packs outside the store, on my rear rack. Without doubt, transport goods by bike, means we really can’t buy heavy or much junk . A cycling lifestyle without a car, encourages a less consumerist lifestyle. Instead we spend our money on necessities and travel. 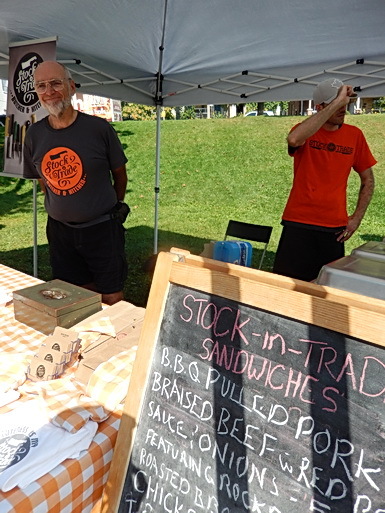 Helping out at his son’s sandwich place at farmers’ market and also at the shop. Toronto 2014. In Toronto, Vancouver and Calgary, he and I each carve our own little tracks to raise cycling awareness. Here, within first 3 min. of this Chinese video clip, Jack is interviewed by local tv during a conference trip in Taiwan on cycling infrastructure. While Jack seems to slog patiently through endless committee meetings and reports for over the past 20 years (! ), I prefer to limit my energy. 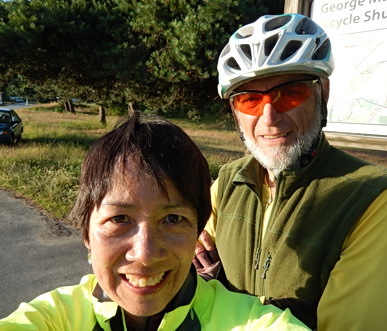 I love sharing the joy of cycling in volunteer work that allows me to meet other cyclists at information tables , key fun cycling events, participating in some rides or just blog about cycling. Rolling out squash-potato gnocchi to accompany his home cooked pan-seared bison (marinated in soy sauce, maple syrup, balsamic vinegar, ginger root, fresh herbs), for our Thanksgiving dinner. But thanks to whirling stars in heaven, there’s more to our love, than cycling on the road and at home for us. Cycling is just a wonderful icing on the cake for us. Cascadia Bakery. Victoria, British Columba 2013. 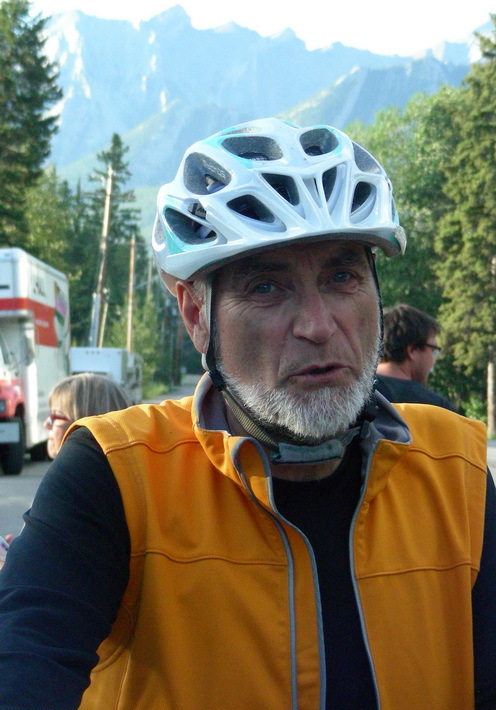 A short profile focusing on one of Jack’s current passions: promoting cycling tourism in British Columbia. He started up the blog which now has grown into a collaborative effort. Yes, I am cycling tourist in some of his blog posts. Yes, we have a certain happy synergy together, Jann! Thx for visiting. Congratulations Jean and Jack for developing a harmonious and fulfilling life together! Communication is everything isn’t it, especially if you’re both to be happy during long spells apart. That’s me and my partner, Adam. 🙂 That kind of kindness and consideration gives me space to be myself in all things, not just cycling — and is invaluable! Thanks for sharing these very personal insights. Glad to hear that Adam is a good partner in cycling and otherwise with you. 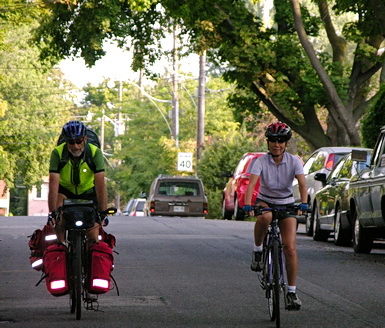 It’s not simple for couples who cycle together. They do have to find ways to adjust with one another when one is slower / different in cycling style or not as competent. I personally think that if a woman has cycled for many years, understands bikes and her needs, she does cycle outside of her partner, in addition to the times with the partner. Excellent post Jean. Cycling is a good thing to share, whether one of you does more than the other or not. In Spain, we don’t use the vehicle. He goes to the shops, complete with bungee cords and panniers. (In Gib, we walk or use the free bus service). I think we are a bike or two behind you, one here now, as we’re not using them in Gib, and five (?) is Spain. But it’s not just the relationship with each other. The camaraderie with the whole cycling community has to be experienced to be understood. Repairing a puncture, and someone always stops to offer help. Meeting strangers and cycling together for a while. I have my partner to thank for getting me back on a bike in my forties. Hopefully, I’ll be back again if the ankle ever lets me. Now, if only more people cycled – and not for sport – the world might be a better place. As for knowing the cycling community, it helps to know some cyclists and who may coincidentally be good friends. Perhaps it’s more in a smaller community/town where that immediate familiarity may happen more easily vs. where we live with almost 1 million in the cities where we live. 🙂 He and I go far back together. 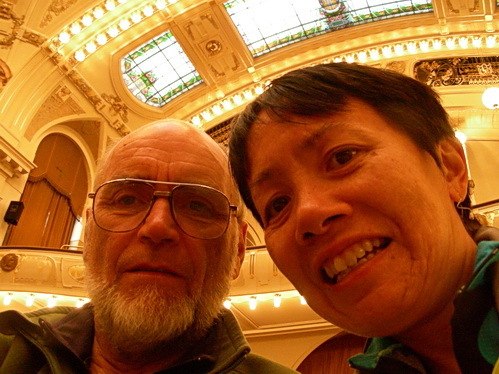 How wonderful to meet Jack via your photos and lovely narrative Jean. It sounds like you have a wonderful life partner! Yes, we are lucky for each other, Sue. No doubt, one can also see with you and your hubby, your travel exploits and explorations across the globe. I loved reading about your and Jack’s cycling life together–and seeing the photos. Cycling is a bit challenging in our town, cobblestone streets, no bike lanes, crazy taxi and bus drivers–but lots of folks love biking in the Andes–outside of a place like our city center. I’m back to blogging after a longgggggggg break. Glad to be back in the saddle again. Great to see you again in blogosphere and here also, Kathryn. Cycling on cobblestone is not something to do fast on such surfaces but I know some European races have been on cobblestoned parts.. Your area would be ideal for simple utilitarian rides at least. Glad you enjoyed the post and keep well. Intriguing interview with the now-departed ex-dictator of Haiti that you had ages ago. Yes, being car-free for several decades is a big enough deal in Canada that someone comments. It’s even a bigger deal when living here out in the middle of the prairies where cities tend to sprawl lazyily because there’s very few natural barriers to stop growth. He used to drive a lot but gave up having a car himself shortly before he met me. Finally, u r back in blogging. A good read. I wish I am like your the other half that can just go biking for weeks and miles after miles. I sense you have some family responsibilities at this stage in life, not because you lack capability in the future. Maybe in your part of the world it’s tougher to cycle without a lot of physical barriers –rainforests/jungle, etc. We have enough challenges, lots of wilderness, mountains, lack of road choice once you go 300 km. north of major Canadian southern area where most of our country’s population live. It makes a difference for services –ie. stores to buy food (instead of carrying loads of food), washrooms, accommodation especially one doesn’t want to camp in lousy weather, etc. It’s wonderful to have a partner that shares your passions in life – lucky you! Hi Lynne: Yes, true. I believe you and your partner share the music passion together. Thanks for your thoughts and good wishes, Jane. We are lucky and blessed to share life and love together. I enjoyed this post Jean. I like that you both share this passion for cycling. I sense partnership, independence, interdependence and freedom to be. I wish you many more years together where cycling is the icing on the cake. It must be tough when you cycle and your partner doesn’t get it and fears terribly for your safety, like in the note you shared. Doesn’t a part of you just die? Thx for your good wishes for us, livelytwist! Yes, it is precisely that: an interdependent life that is equal yet independent in our identity with freedom to grow. We do feel sorry for other couples where one just doesn’t understand the other person who needs to enjoy cycling for awhile. There must be a consistent level of trust also in the relationship and daily voluntary communication with one another. A really great post Jean! It’s so nice to virtually meet your partner especially after our chat about who usually cooks in the household! I really enjoyed looking at your pictures too. I think it’s beautiful that you too share the same passion. My husband has just took on bicycle riding as a hobby! He goes every Saturday morning for a ride of about 37 km. I don’t think I ever mentioned that my partner does the lion’s share of cooking. It’s pretty equal. It’s just that we each are better in certain types of dishes than the other person–ie. I make stir fries on the fly from anything and usually tastes decent. Whereas he does veggie pureed soups of all combinations, fruit compotes and yes, does bison dishes more carefully than I would. That’s great your hubby has taken up cycling and enjoys it. Hope you 2 ride on some jaunts around town, Rita. The cycling world can be another place to be..even for you. Love this post, J, and the shots of you guys at the Olympics and Winterpalooza. You make a smashing couple and I enjoyed the glimpse of the surprising journey this has been for you in more ways than one. My boy and I eat bison. Did you buy the gnocchi dough? Appreciate your fly-by visit here, holistic. 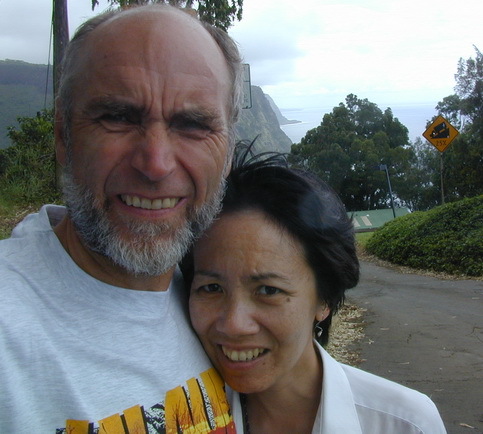 Yes, our journey together has been more than just cycling and long one so far –nearly last 24 yrs. together. 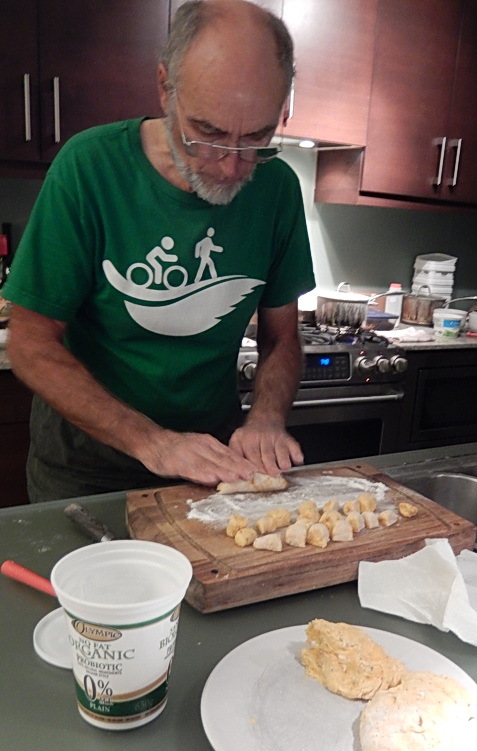 No, the gnocchi dough that you see in the photo was made from scratch by him from a recipe we found. It was delicious. Hope you had success cooking bison –it doesn’t need much cooking time. ONLY if you wouldn’t mind, could you email me the gnocchi recipe? Or fwd my email addy to the good Mr. for it? Only if it’s no imposition to either of you. No need to reply. =) Thx. This is my favorite of your posts. It is wonderful to (finally) hear about Jack, and about the two of you together. Makes me feel better for having two bicycles. 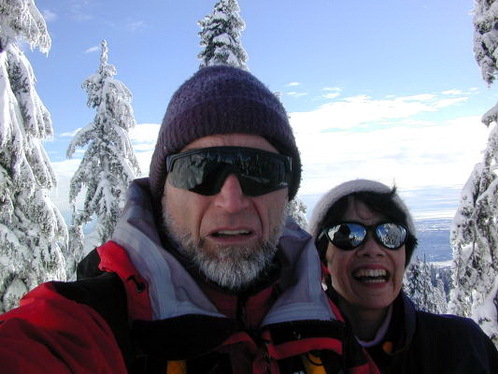 Favorite photos: Jack on the Vancouver hill, and the two of you in Kauai. Will check out Jack’s blogs. My husband and I have been traveling the world, much by air. When he retires next year, however, I wonder if we won’t want to do more travel by muscle power. Hurray for all the two of you do to promote cycling. Well, it takes a reader from the Northwest coast to recognize that Jack was cycling up a hill with the treed mountain in the background. 🙂 A street only a few blocks from downtown Vancouver. 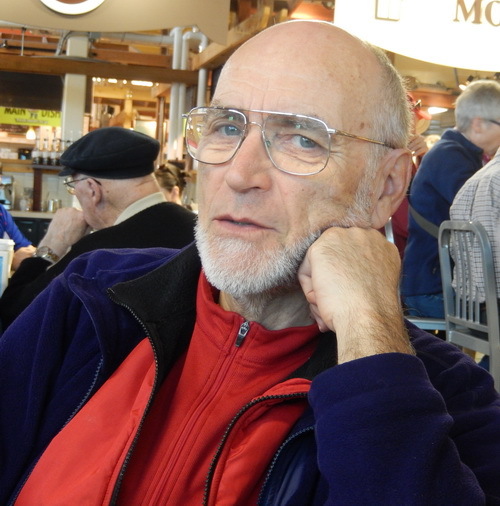 One of Jack’s blogs covers touring British Columbia. Feel free to ask for any tips on travelling into British Columbia, jbw. Does your hubby cycle much? You are also along the Amtrak rail which has a bike car for certain trains. Train goes into downtown Vancouver and right within 2 blocks of major bike routes, some separated from cars. Hi, Jean!! My sincere apologies for being so late getting to this post. How nice to finally “meet” Jack. Sounds like a man of many talents, and he clearly has the energy of 10 men– no, better make that 20!! No guy could do all that if he wasn’t centered, thanks to having love and support and the right partner– IMHO. Home-cooked pan-seared bison (marinated in soy sauce, maple syrup, balsamic vinegar, ginger root, fresh herbs) for Thanksgiving dinner?? Set another place, will you? ?– I’m coming! Oops, that’s right, Canada’s Thanksgiving Day has come and gone already. Sigh. Oh, well– maybe next year!! Maybe one day if you head out to Alberta/Canadian Rockies, you will be served this bison dish! Kind of hard to completely avoid talking about Jack in my blog so I thought to bring him out of the shadows for once. Good to hear from you, Mark and happy American Thanksgiving soon..regardless of turkey or not. This is such a fabulous image collection of you two enjoying cycling and enjoying each other`s company too. I`d love a copy of the gnocchi recipe. How about doing a Jack`s recipes`s collection post in the future? We have a recipe shortcode that I used and like. Great to see you here. I know you’ve been recovering and taking a breather (I think). Well, here is the recipe timethief. It’s No.4. Doesn’t take long to cook the gnocchi since the potatoes have already been cooked, etc. Let me know how it works out. Other Internet versions include Parmesan cheese and butter which we didn’t use. I find that abit too rich for my palate. We had a bison and wine flavoured with Saskatoon berry sauce over it. But a lighter wine sauce perhaps would be lovely. It’s a wonderful switch-up from just plain potato gnocchi. Very lovely to meet Jack. Totally enjoyed looking through the collection of photos here. It’s great that cycling is a hobby, a passion that something the both of you share. It’s interesting to see that the two of you don’t “compete” against each other but instead support one another. Sounds like there is no jealously between the both of you to see who rides the fastest and cycled the most places. Jack sounds like a compassionate, level-headed and encouraging person. You’re very lucky to have a partner like that. No, not between us. We each recognize that we will change each year in our individual cycling stamina and speed. I’m not speedy but I don’t dwandle along and talk a lot while biking. Just a few words, then peace. 🙂 I’m just not like that. So riding with him or a good friend is general companionship of enjoying sights along the way, etc. He is a naturally patient person and knows if he doesn’t wait for me if we’re in area that I don’t know …the price will be paid, because I may take the wrong turnoff behind him. So more lost time. We know that we’re simply lucky to have each other in knowing that not all couples even understand cycling together, much less like cycling together. Yes he does cook often, like I do also. Yup, some other dishes are his culinary signature. 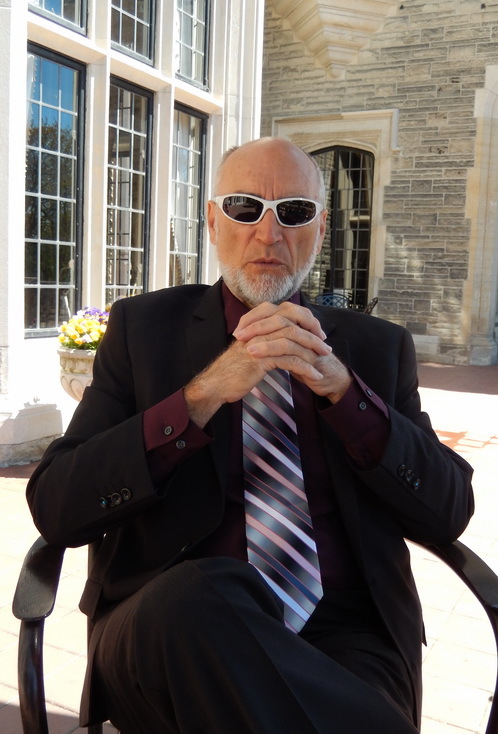 We also talk about work, what he does, what I do and serve as each other’s sounding board. Hope to see Jack again sometime soon on your blog. I will also check out the other blogs you pointed out. I’m so glad I followed your blog! Did I tell you that I was in Vancouver for a millisecond and was BLOWN AWAY by how awesome the cycling infrastructure and the cycling community seemed to be?! I didn’t realize until now that YOU lived in Vancouver. Wow. Thank you for posting. I love all of your photos and the way you talk about your relationship with your partner. I can’t WAIT to go back to Van!!! It is so damn beautiful. In Vancouver for a millisecond, zesty? You mean it wasn’t long enough? 😀 I still go back to Vancouver since over half of my possessions are still there. It’s still home to me. Glad you enjoyed the area alot and saw more attractions to visit in the future. Think in summer and early fall, it’s even more beautiful. Cherry blossom time is in April. There’s an annual international haiku contest, events, etc. I guess it’s like Washington DC going ga-ga over their blossoms, except in Vancouver it’s cherry blossom trees against mountain backdrops. If you want the scoop on local stuff, routes for the Vancouver, Rockies-Calgary, southern Ontario-Toronto area I’m here. If I don’t know, my partner might know since he’s done some very long cycling tours on his own. Looks like I’ll have to include more Vancouver and maybe Vancouver Island photo eye candy..great. Another excuse why I take hundreds of photos. IT WAS NOT LONG ENOUGH JEAN! 😦 Oh I didn’t know that you lived in Vancouver part time! Can’t wait to burrow into your blog :D.
Oh god. I can ONLY imagine how beautiful it is in the summer!! I’m dreaming that I can make my way back after this trip…I mean heck, how am I going to get BACK to CT after this trip?! Probably have to work for a bit to schedule a flight, or I might find an opportunity to settle down someplace else haha. Please please please post about Vancouver you have at least ONE hungry fan 😀 Thanks for the tips for cycling in your beautiful hometown! I will let you know what the future holds. Some great motivation while you earn money. Go for the job(s) and then Vancouver soon again! Wow this blog is great..very inspiring couples. What a fantastic post!! I’m jealous of what you 2 have. My wife and I are working on some of that, but we have a long ways to go. Weird after 35 years of marriage! I’m sure you’re grateful she just bikes with you –regardless of distance. You never know, Judy. Just try a bike that seems to fit first.. Thx for visiting! I love to read about how a couple met and could actually make it work throughout the time, like you guys did! That’s amazing and inspirational too! Hi, NE. Just to let you know I lived in Vancouver for 8 yrs. It’s still 2nd home for me. 🙂 It’s been a great life journey with him so far.